“Variance: Raise Your Weapon,” by Josen Llave is an energetic and fast-moving sci-fi thriller. Intriguing, non-stop action, set in an extraordinary alternate world, this space opera will satisfy newbie and hard-core sci-fi fans alike. Scientifically blessed with Cellular Infinity, Utopians of Azure enjoy immortality, living in total peace and love. When confronted with danger, they simply smile and turn the other way. This becomes a problem when the Kazats of Crimson, who believe Utopians are pure evil, vow to completely annihilate the race. Paul Benedict is a different sort of Utopian. Paul possesses independent thinking and free will and knows he must fight against the norm to save his family and the Utopian race from total extinction. With the help of his family, an AI named Siren, and a few unlikely cohorts, Paul sets out on a mission doomed from the start. For in order to accomplish his task, he must fight and win the gladiator game called Divine Might, a seemingly impossible feat, where he will face every conceivablechallenge, and some beyond the wildest imagination. Intellectually stimulating and captivating, Llave’s writing style really sets the tone for non-stop entertainment. The setting is quite unlike anything I could ever imagine–both unique and customary at the same time, as distinctive out-of-this-world machinations combine with an almost old-fashioned sense of family and tradition. The story is full of action, and great detail is shown in the battle scenes, providing intensity and moving the plot along nicely. 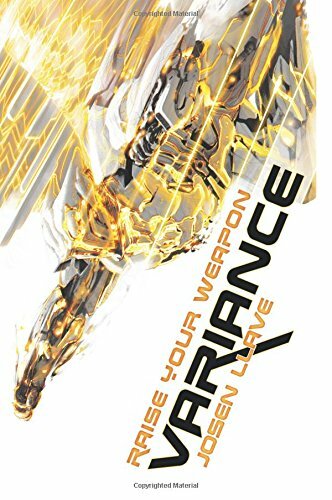 I thoroughly enjoyed the characters in “Variance.” The Utopian citizens created lemming-like images in my mind, while the character of Ryan is hilarious, providing engaging sarcasm and almost unintentional comic-relief. Siren–the AI, was the most captivating character in my opinion. She completely unnerved me, as I likened her to the AI in the movie, “Ex Machina” by Alex Garland. Paul Benedict as a protagonist grew on me as he developed with the progression of the story. There are some cheesy moments with Paul and his daughter involving a somewhat grating catch-phrase they use between them but hey, it does establish a sense of familial tradition. Overall, I highly recommend “Variance” by Josen Llave as a thrilling sci-fi experience, and look forward to the sequel, “Celestial” coming soon.